RICHMOND, VA (October 26, 2015) – At home in Northern Virginia, Lauren Harkes grew up with a backyard that featured some not-so-ordinary competitions between kin. Consider the players in these 2 v 2 plus 1 or 3 v 2 soccer scenarios: Former U.S. Men’s National Team Player, two-time MLS Cup Champion and Hermann Trophy winner at the University of Virginia, John Harkes; his wife, Cindi Harkes, a former U-19 National Team member and three-time All-ACC selection while at UVA; Ian Harkes, a junior, starting in the midfield for the No. 2 team in the country, Wake Forest University; Lily Harkes, a sophomore midfielder starting for Bishop O’Connell High School; and Lauren, playing in the center of the park as a freshman at Clemson University, presently No. 6 in the nation. That same backyard was often used as a training ground where Lauren and her siblings developed skills and acumen with a pair of experienced coaches – their parents. John, the first American to play in the English Premier League with Sheffield Wednesday, was recently named Director of Soccer and Head Coach for FC Cincinnati of the USL, a partner with MLS. Cindi, who traveled to England with John in the ‘90’s and competed on the Sheffield Wednesday Ladies, is the former Director of Coaching at FC Virginia and current Age Group Director at the McLean Youth Soccer Club. She also coaches the U-17 ECNL entry and assists the ECNL U-16 side where her youngest, Lily, is an attacking midfielder. “They never pressured us, but they were always there for us,” said Lauren. Even her numerical uniform choices reflect an independent character. While her brother and sister chose No. 16, the aggregate of their mother’s (10) and father’s (6) jersey numbers, Lauren opted to wear No. 10 for a time and currently dons the No. 6 for the Clemson Tigers. For Lauren, soccer became her unconditional passion, but there was a spell when she had a ripe curiosity about alternative athletic endeavors. One would not be astonished to discover that in the Harkes’ household, the television is tuned incessantly to Serie A, Champions League, EPL, La Liga, MLS or USL. The girls all support Barcelona. Ian prefers Liverpool and John favors Arsenal, a one-time arch rival to Sheffield Wednesday. Ironically, the Owls will host Arsenal in the fourth round of the Capital One Cup tie on Tuesday, October 27. While Lauren can remember seeing her father play for DC United in MLS, the favorite memory of her dad on the pitch comes from the Harkes’ video archives where John made history in Great Britain where Lauren’s brother, Ian, was born. Entering her freshman year in high school, Lauren had clearly decided to put all her athletic efforts into soccer. At McLean, Lauren played a vital role for a club team that has had regular success in the ECNL under coach Nadir Moumen and Director of Coaching, Clyde Watson. At Bishop O’Connell, Lauren excelled in both the academic and soccer environs. Lauren was captain and First Team All-Met in her junior and senior seasons. She also helped O’Connell to four consecutive WCAC Championship appearances. In her final high school season, Lauren had an inimitable experience – the first instance of playing on the same team as her freshman sister, Lily, a Junior Olympic swimmer in middle school. Observing his daughters grow together as teammates provided warm memories for John who played soccer as a freshman at Kearny High School in New Jersey with his brother, Jimmy, a senior. It was 1982 and they won a state championship together – and like daughter, Lauren, Papa John assisted Kearny to four consecutive state title matches. Lauren and Cindi Harkes were both racing home from school (Cindi teaches at Bishop O’Connell’s rival, Paul VI which defeated O’Connell for the first time in 16 years this fall). It was the spring of 2013 and they had a flight for an unofficial visit to Clemson. After the eight hour drive through the night, the weary pair pulled into a hotel at 4am and got a brief snooze before their 8am meeting with head coach, Eddie Radwanski. On Oct 8, Clemson lost at home to the Cavaliers, 2-0. 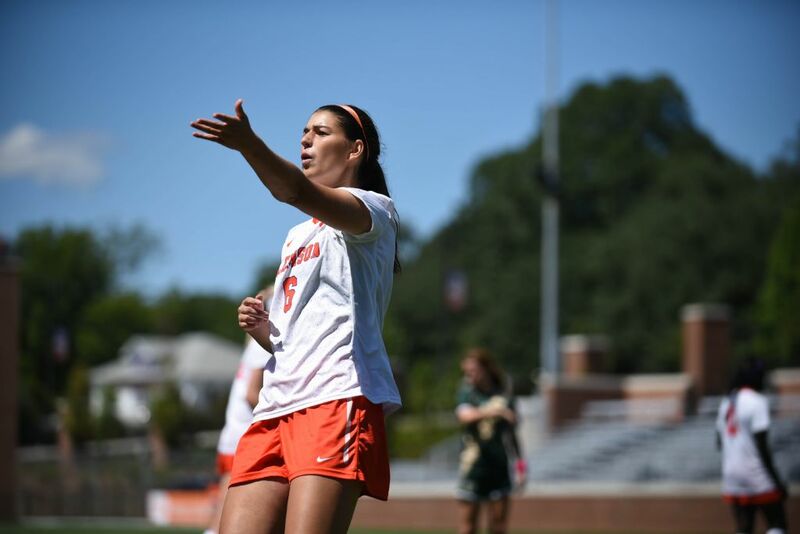 Lauren, who had started two matches and scored a goal in her collegiate debut, was sidelined with shin splints. Regardless, her college coach has high expectations for a young player who fits the Clemson profile. “I was banking on her DNA,” suggested Radwanski who was John’s teammate at the Olympic Sports Festival in the mid ‘80’s – where John and Cindi, who was playing on the women’s side, first met. The finish was pure, in the mold of a striker. Regardless, Lauren and her two siblings relish their roles in the center of midfield, akin to their father. Cindi was a striker and is confounded that none of the three have followed in her No. 9 foot- steps. At the moment, Lauren believes her strengths reveal that she functions best as a central midfielder. “She will go into a tackle, she doesn’t care,” exclaimed her mom. “She’s tough on the tackle,” remarked her dad. “She has the qualities that are going to help us over the next few years,” said Radwanski. For now, Lauren rubs ice on her shins daily in the hope that the pain will subside while she closely monitors the paths of her brother and sister. Lauren, you are an Amazing Young Woman. Thank you for sharing your story.